While the show is still in it’s infancy The Originals, has surpassed its predecessor in terms of content, quality and cast. Following in the footsteps of Buffy the Vampire Slayer, CW's The Vampire Diaries series created a spin-off television show called the Originals, which premiered the fall of 2013. The spin-off series debuted during season four of Vampire Diaries during an episode entitled "Originals". As the title suggests, The Originals continues the story of the original vampire family, the Mikaelsons, as they venture to New Orleans to reclaim their lost empire from the clutches of Klaus's protégée, Marcel. Marcel has power over all inhabitants of New Orleans, and while tensions rise between all supernatural creatures that live there, ever-ambitious Klaus tries to return to power over them all. Taking a page directly from the Buffy/Angel playbook, The Originals is a much darker adult show than the teen angst vampire diaries. Centering on more adult oriented themes and situations, most character motives lie within the gray area instead of black or white. While four of the shows main cast are from character's introduced on Vampire Diaries (Joseph Morgan as Klaus, Daniel Gillies as Elijah, Claire Holt as Rebekah, Phoebe Tonkin as Hayley) the rest of the main and supporting cast easily blend in with the already known characters. Stand out performances by Charles Michael Davis (Grey's Anatomy, Switched at Birth) as Marcel, Leah Pipes (The Deep End, Sorority Row) as Cami, and Danielle Campbell (Prison Break, Starstruck) as Davina are some of the best seen on television in a long time. As with most recent television releases by Warner Bros, The Originals: The Complete First Season looks amazing. Presented in 1080p amaphoric widescreen the blacks are crisp and clear, and there is no signs of artifacting in the entire set. The producers of the Originals went to great lengths to produce every episode with the same quality as a theatrical film production and it truly shines through with the DTS-MA audio track. Aside from just including a copy of the Blu-ray and a digital copy, Warner Bros went all out and also included a DVD copy of the series to take on the go. Add to it an abundant amount of special features which include, commentary on the pilot, Comic Con and Paley Fest panels, backstory of the Mikaelsons shown in a montage of scenes from their Vampire Diaries days, blending fact and fiction in the depiction of New Orleans, deleted scenes, and a gag real. You have the complete package that any casual or hard-core fan of the show would love to have. While the show is still in it's infancy The Originals, has surpassed its predecessor in terms of content, quality and cast. If creator Julie Plec, cast, and crew of The Originals continue to show this kind of production quality and performances for season two, this Emmy nominated show has a long run ahead of it. The Originals Cast Discusses Season 2 at Comic Con 2014. 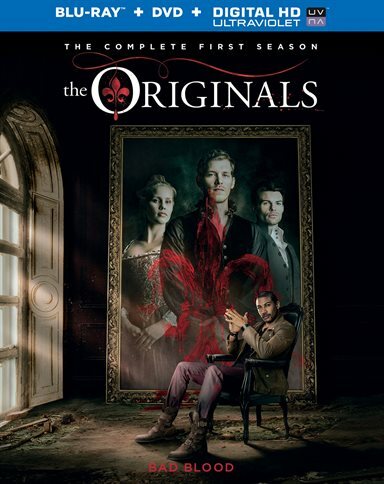 Download The Originals: The Complete First Season from the iTunes Store in Digial HD. For more information about The Originals visit the FlickDirect Movie Database.